If you grow lilies, then be well aware of the lily leaf beetle, its life cycle and how to manage this pest and pass the information along to your customers. Lily leaf beetle (Lilioceris lilii) is known to lay its eggs and develop only on true lilies, Lilium species (Turk's cap lilies, tiger lilies, Easter lilies, Asiatic and Oriental lilies) (not daylilies), and fritillaria (Fritillaria sp). Although lilies and fritillaria are the primary hosts, lily leaf beetle also feeds, sometimes just lightly, on a number of other plants, including lily of the valley (Convallaria majalis), soloman's seal (Polygonatum sp. ), bittersweet (Solanum sp. ), potato (Solanum tuberosum), hollyhock (Alcea) and various hosta species. It is however, a devastating pest to true lilies. The lily leaf beetle (LLB) is native to Europe and was discovered near Montreal, Canada in 1945. Its damage was limited to the Montreal area for decades, until discovered in the United States in 1992 in Cambridge, MA. It is thought that LLB arrived in a shipment of lily bulbs from Europe. Since then, LLB has spread throughout much of Massachusetts and is working its way throughout New England. Lily leaf beetles are strong fliers and are also moved from one area to another on host plants. Both the immature stage and adults cause damage by eating the leaves and buds. Adults and larvae are commonly found together devouring lily foliage. Often, they consume all the leaves leaving only bare stems. 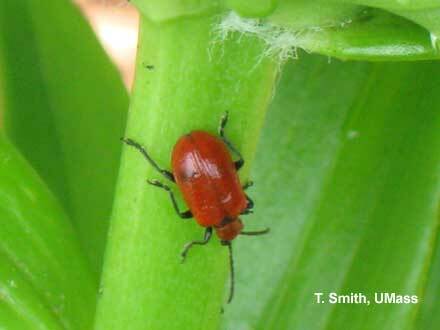 As soon as lilies break through the ground, over-wintered, bright red adult lily leaf beetles will begin to actively feed on the foliage. The adult beetles are about ½" long with a very bright red body, and black legs, head, antennae, and undersurface. Over the past two years this emergence has occurred around the middle of April in the warmest parts of the state. The beetles are foraging for food and seeking a mate. The adult beetles will begin to lay eggs on the undersides of leaves, usually in May. The eggs are irregular-shaped and laid in rows that appear as tan-colored lines. Just before the eggs hatch, they will turn orange and then a deep red color. The eggs hatch within 4-8 days into the immature or larval stage. The larvae are slug-like in appearance with soft, plump orange, brown, yellowish or even greenish bodies and black heads. The young larvae initially feed on the undersides of the foliage but eventually will move to the upper surfaces and the buds. While they feed, the larvae pile their own excrement on their backs which makes them objectionable to hand-pick. The larval feeding is the most destructive and lasts for 16-24 days. The larvae then drop to the soil to pupate. The pupae are florescent orange. Adult beetles emerge 16-22 days later and can be seen feeding throughout the rest of the growing season. Adult beetles over-winter in sheltered places, soil or plant debris in the garden or woods, not necessarily near the host plants. Adults prefer areas that are shaded, protected, cool, and moist. The over-wintered adults emerge early in the spring and begin the cycle again with feeding, mating and egg-laying. Each female beetle produces 250-450 eggs. If your customers only have a few plants in their garden, hand-picking adults and eggs can be effective. For more than a few susceptible plants, pesticide treatments may be needed. Products containing Neem (Bon-Neem, Azatin), a botanical insecticide, have been shown to kill very young larvae but must be applied every five to seven days after egg hatch. Products containing spinosad a microbial insecticide, may also be effective. Spinosad is sold as Conserve and Entrust for commercial growers and Monterey Garden Insect Spray, BULL'S-EYE™ and others. Before recommending a product or applying any pesticide, READ THE LABEL and apply only as directed on the label. When using pesticides it is important to take precautions to protect pollinating insects such as bees. Apply pesticides in the evening when fewer bees will be foraging and when spray drift due to wind and volatilization due to heat are at a minimum. Do not spray during windy weather to prevent drifting. Avoid spraying when plants or nearby plants (including weeds) are in bloom. See the fact sheet "Protecting Bees from Pesticides" (Purdue University). Recent research efforts to control the lily leaf beetle have concentrated on classical biological control which acquaints natural enemies with their host. LLB came from Europe so European parasitoids were released with the intent of establishing and distributing the themselves to provide long term control rather than needing to provide regular releases each year. Areas within a few miles of the research release sites of the parasitic wasps are benefiting already. Here is an update on biological control research for LLB. The University of Rhode Island Biological Control Laboratory, in collaboration with CABI-Bioscience and colleagues in France, identified a complex of four larval parasitoids, which causes a high level of parasitism throughout Europe. On the basis of parasitoid surveys in Europe and laboratory experiments conducted in the USA and Europe, it was determined that T. setifer, L. errabundus, and D. jucunda were safe and likely candidates to control L. lilii. Tetrastichus setifer is likely the best candidate for controlling the LLB in the Northeast. It is widespread throughout Europe and it has been relatively easy to establish in RI, MA, NH, and ME. Lily leaf beetle populations have declined substantially at the two oldest release sites. They last released T. setifer in Wellesley, MA in 2001 where it has heavily parasitized LLB larvae ever since (100% parasitism at peak larval density in 2005). We found similar results in Cumberland, RI where we last released T. setifer in 2002, with 100% parasitism at peak larval density in 2005. From the parasitoids released in surrounding states, they found T. setifer establised in Bridgton, ME in 2004. Tetrastichus setifer has also spread several miles from release sites. Lemophagus errabundus was found in a lily garden 3/4 mile from their Plainville, MA release site in 2005, indicating that it is not only established from releases in 2003 and 2004, but it has spread a considerable distance. They also released this species in the Kingston, RI plot where they found good parasitism in the weeks following release. Diaparsis jucunda has proven to be more difficult to establish against the LLB. It is found at higher elevations in Europe, and appears well-suited for northern New England, but they have not yet recovered overwintered parasitoids at any of their 2004 and 2005 release sites in RI, MA, NH, or ME. In 2005 they also released LLB larvae parasitized by D. jucunda into their lily plots to determine if this is a better way to establish this species.